I am learning new stitches every week and I am using the wonderful print, Flowers of Paradise, from Dala-Floda, Dalecarlia, Sweden, by Karin Holmberg, for practicing. Karin has given the old traditional embroidery technique a modern twist. She became well known among embroiderers in Sweden for her traditional embroidery on a simple hoodie. She has made the print I use for my TAST stitches, inspired by Dala-Floda stitching and knitting tradition. I made a visit to Dala-Floda Hemslöjd ( Dala-Floda Art and Craft Assosiation) last summer and found the print in their shop. 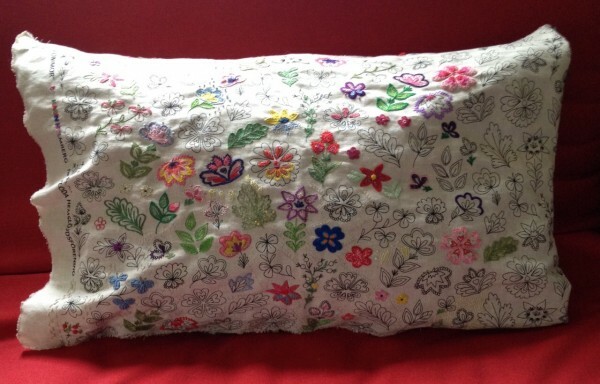 When all flowers are filled with stitches they I will make a pillow for my red sofa in my country house in Furudal (another village in Dalecarlia also known for rich textile heritage). Somebody in the TAST Facebook group asked for stitches suitable for letters. That question gave me the idea of stitching even the letters in the selvage with TAST stitches. I used couching, fly stitch, buttonhole stitch, detatched chain stitch and regular chain stitch. Karin Holmberg has made other amazing jobs, for example embroidered book covers for the republishing of one of Sweden’s most famous writers Wilhelm Moberg, who has written four novels on the emigration from Sweden to America during the 20th century. I wrote about it here. She has also published three books of her own, among which I like the first one best, Karins broderier. I have written about two of the books, here and here. You can also follow Karin Holmberg on her blog. Satin stitch is imporant in in Dala-Floda embroidery tradition. I will show you more from this rich textile tradition TAST week 13, which is Satin Stitch week. This entry was posted on onsdag, september 30th, 2015 at 07:14	and is filed under Allmänt småprat, Broderi, TAST (in English). You can follow any comments to this entry through the RSS 2.0 feed. Both comments and pings are currently closed.